﻿What Makes Turkish Gulets So Alluring for Yacht Charters in Turkey? The Mediterranean coast of Turkey is one of the most popular holidays destinations in Europe each year. Southern Turkey offers 300 days of sunshine and a fabulous atmosphere with its diversity in culture and history. As families and traveler groups are looking for alternative ways to enjoy the pleasantry in holidays abroad, yacht charters in Turkey have seen a remarkable rise in potential bookings in a past decade. Many holidaymakers have known to enjoy their yacht charter holidays aboard various types of vessels such as motor yachts, bareboats and other sailboats. What has caught the attention of some are wooden sailing boats called gulets. Gulets originate in Turkey. They were first constructed in the bustling seaside city of Bodrum, to later expand to various other regions along the south coast of Turkey; namely the town of Bozburun in the ancient Carian city of Marmaris, Antalya, and Istanbul – where many super yachts and various other famous luxury boats have been known to be built. Gulets started out as sponge fishing boats and as time went by, were developed, and better constructed to accommodate long distance boat cruises along the shores of Turkey. 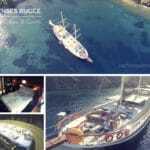 This further caught interest to other European countries and now travelers can easily charter a gulet from countries such as Italy, Croatia, and Greece, as well as other places. However the popularity still remains to be chartered from Turkey – home of gulet heaven. Turkish gulet charters range in an array of sizes from 2 cabin gulets that accommodate up to 4 passengers to 56 meters in length in the high class gulet yachts – otherwise referred to as motorsailers. The older models of gulets are of traditional design. They are handcrafted from a variety of woods such as mahogany and teak, which is generally seen on the decks. One of the main features is that they are literary handmade yachts that can take up to two years or more to build – depending on the quality, details and owner’s other requirements. Gulet cruises are incredible relaxation holidays. They offer the freedom for guests to do whatever they wish to do while cruising the magnificent deep blue seas of the Med. Guests can also choose their itineraries and alter them while on route if they so wish, provided that it meets with the captain’s approval – since he/she is responsible for the safety of both the guests and crew on board. The whole southern coast offers many gulet cruise destinations. While some guests prefer private gulet cruises Bodrum holidays, others will opt for Marmaris gulet cruises. Turkish gulet cruises are defined in many ways. While some travelers prefer the economic route, others will desire more luxury in accommodation, facilities and amenities. Otherwise the gulet charter destinations stay the same. 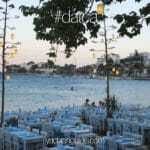 They do not change because the gulet hire is a certain price. 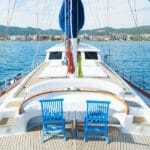 There are a variety of options on board Turkish gulet charters. While some Turkish gulet holidays will offer a wide assortment of luxury water toys such as jet skis and water skis for pleasure and excitement, some will have a few pairs of snorkels and fishing gear only. But that is not to say that guests still cannot enjoy some fun at sea. 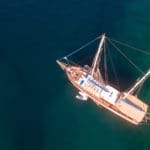 While en route and traveling, gulet charters will drop anchor in quiet secluded bays where guests will find private companies offering all sorts of water sport toys for them to enjoy. From banana boat rides to ringos, from paragliding to jet skiing there is certainly a choice or choices that can be made to satisfy the adrenaline. Well what makes Turkish gulets so alluring? In addition to the above mentioned, they are unique in many ways. No one gulet will look or be built, designed and decorated like the next – even if they are the same in length. These are very classic style vessels that offer much of the of Turkish culture. These offerings include tasty cuisine from the Turkish kitchen, and other tasty delights. Gulet dining is an altogether special experience when out at sea and whether it is just after sunrise or during a different sunset each day of the week. The whole gulet cruising experience is quite magical to many who have had the chance to travel on board one. They are unique and not just considered ‘any boat’ charter. Just about everything, every part is made from wood – where in some areas hand-carved with unique Turkish style decor. The cabins, and again this depends on the gulet hire you have booked, are comfortable, if not surprising luxurious – particularly the ones that have private jacuzzi tubs fitted in the VIP or master cabins. Of course hot tubs can also be found on the deck of many gulet charters as well. You can also be surprised how affordable gulet cruise holidays in Turkey can be. With both luxury and comfort, their weekly priced, once divided among the group, can be better priced compared to that of many 5 star hotels. With gulet cruises you are constantly seeing new and special yacht destinations and visiting spectacular architectural ruins left from prior civilizations – dating back thousands of years. The alluring part of Turkish gulets and gulet cruises are vast. As much as each gulet is different and unique from the next, so are the gulet cruise holidays in Turkey.